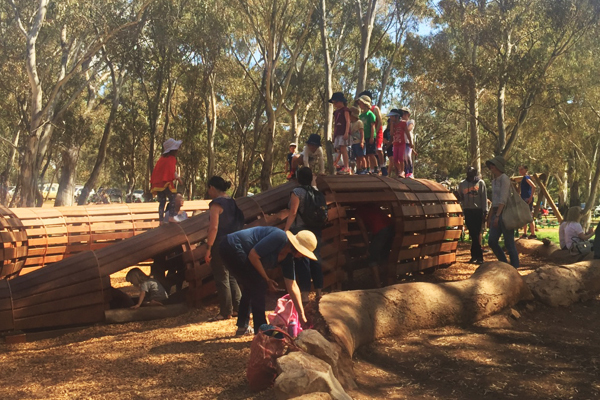 Recently, while on a trip to Australia, my colleagues and I had the pleasure of stopping in at a brand-new nature playspace just outside of Adelaide. 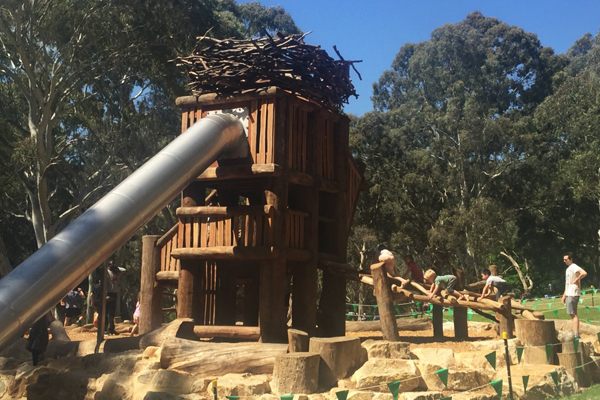 Located within the 2,058 square-mile Morialta Conservation Park, the Muka Muka Rrinthi nature playspace is nothing short of dazzling. Not to mention, the footprint of the playspace is huge. While designed to be best suited for children ages 5-15, I saw many younger tykes happily creating their own play opportunities. It is easily a full-day, take-a-picnic-lunch destination for families looking for something wonderful to do with their children. 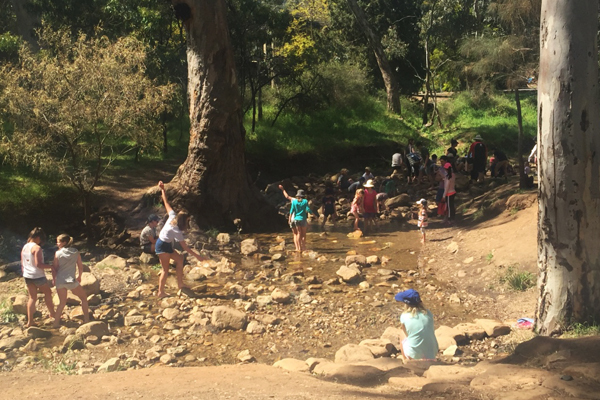 The playspace had just opened within the week preceding our field trip to Morialta, and as luck would have it, the weather was sunny and balmy the day we visited. From the moment we set foot in the Recreation Area, and right there in front of us was Muka Muka Rrinthi in all its splendor, I felt transported back to my childhood. Back then, the activity du jour was to go outside, find some friends, and just figure out, on the spot, what to do…in the cornfield behind our house, the empty lot at the end of the street, or just kick up dirt and create mud cities on the street (our street was not paved until I was well into my teens). We played, hard. I saw this happening all over again. On the day of our visit, the park was packed full with children of all ages, doing what they do best, engaging in spontaneous play, outdoors. “Bubble wrap” removed, this was a playspace full of happily messy, dirty, and soggy wet children outside having a great time, taking good risks, and being tech-free kids. Muka Muka Rrinthi is comprised of five themes: Climbing Boulders, Frog Island, Great Snake, Eagle’s Nest, and Kookaburra Nest. Connecting these themed areas are many meandering paths, trees to touch, explore, and climb, and the most amazing creek (a part of the existing Conservation Park). The play structures are, in fact, works of art, comprised of stone, native trees, and salvaged timber, which seamlessly integrate into the landscape. 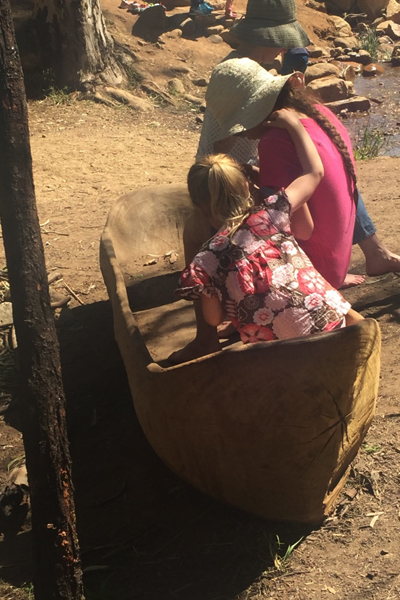 Nothing looks contrived, including what the children create from loose parts, such as little cubby houses decorated with found objects like flowers and grasses and stones, and ‘beaver’ dams in the creek. There was a dual sense of easiness and purpose that pervaded the nature playspace—hard to describe, but it was there. The children were engrossed in what they were doing and were in the moment. Laughter and chatter was in abundance, and it was evident that problem solving, turn taking, and creativity were in overdrive, but in a good way. 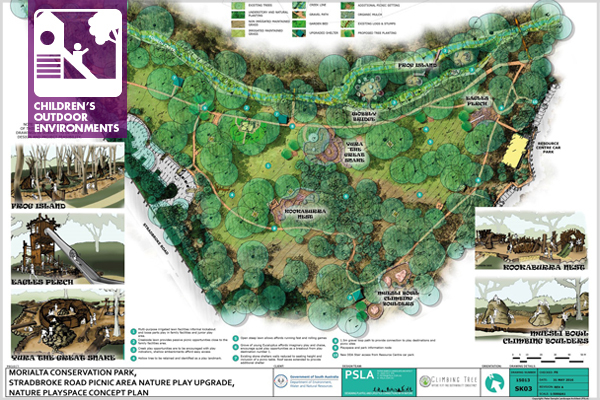 The design concept proposed to incorporate myriad opportunities for children to take on physical challenges, to blend in native plants and animals (alas, no koala sighting when we were there), and Aboriginal culture. I think that on all counts, the concept was successfully translated into reality. 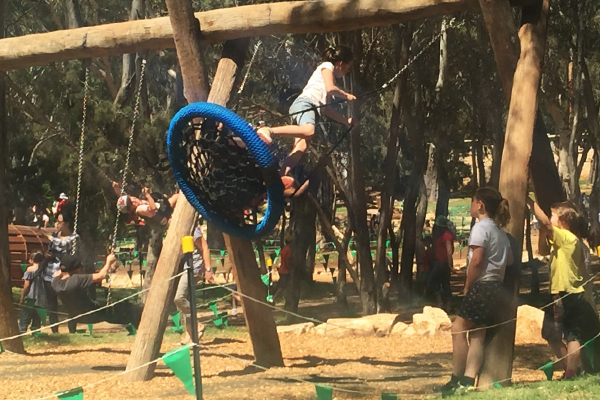 Built at a cost of $900,000 (Australian dollars), with support from the Department of Environment, Water and Natural Resources, playground designers Peter Semple from PSLA and Simon Hutchinson from Climbing Tree have set a high standard for future nature playspaces throughout the world. 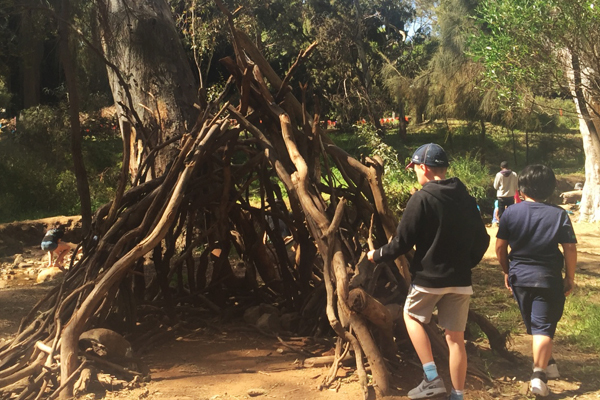 If you can, prioritize making the Muka Muka Rrinthi nature playspace a stop on your next Australian walkabout. Amy Wagenfeld, Affiliate ASLA, PhD, OTR/L, SCEM, FAOTA is Co-Communications Director for the ASLA Children’s Outdoor Environments Professional Practice Network (PPN). She is Principal of design+cOnsulTation.